You’re walking along Pier 39 in San Francisco, and you decide that what you see in front of you would make an excellent photo. 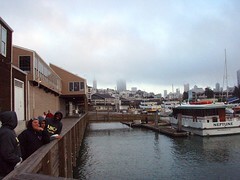 You pull out your camera phone, point it in the direction of your view of the fog rolling down the City, from the Pier. Snapping the shot, you tell your phone “vacation” and “San Francisco,” and the picture is stored in two different folders – the vacation one, and the San Francisco one. Sounds good to me. When we think of tagging, it’s normally in the context of typing a word into a text box or clicking upon a previously created tag while labeling an image, or a link to a web page, or a video. A patent granted to Nokia today talks about creating voice enabled tags to make it easy to file images taken with a camera phone, and similar devices. Multiple voice tags could be used to place an image in more than one folder, and images could be stored uncategorized until later, and then organized by voice tags. The system could be used to store images on an external storage device. The nice thing about this system is that it doesn’t require any buttons to be pushed, or menus to be sorted through when tagging and organizing images at the time a picture is taken. Imagine a voice tagging system like this working together with the automatic geotagging in a system like Yahoo’s ZoneTag to a site like Flickr. Could be a lot of fun. There’s some exciting stuff coming out in that market, and I expect that we will see a lot of crossover from mobile in the web design/development and search spaces. I can’t imagine that we’re too far away from voice search, voice tagging and annotations of blog posts and web sites, as well as blog posts transcribed from verbal entries made on a phone. Voice tagging is a small step, but it leads in an interesting direction. As that kind of information finds its way on the web, there will be some metadata attached to it, such as time stamps and geotags, that will have some implications for search as well – local search as well as a broader organic search. Wow, thanks for the heads up Bill. The mobile/voice market is going to be an interesting one to watch over the next few years I suspect. Previous Previous post: Does Alexa Use Search Results to Identify Related Pages?